Please select your colors under Variations, we have 94 colors to choose from. For many years Cushing’s Perfection Dye was a “union” type dye, designed to be suitable for a variety of plant, animal and synthetic fibers. In response to the changing availability of raw materials and to increase the effectiveness and ease of use of our dyes, we reformulated them into two types, acid and direct. Acid dyes are suitable for wool, mohair, and nylon. 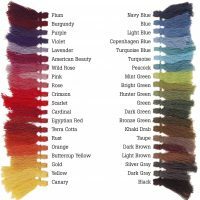 Direct dyes are the better choice for cottons and cellulose materials, plus linen and rayon. Silk dyes best with one type or the other, depending on the particular characteristics of the silk. Acid dyes are used in a process similar to the old union dyes. 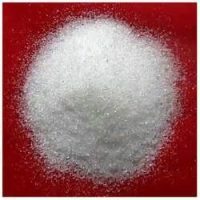 A dye solution is prepared by measuring the dry powder and dissolving it in boiling water. Setting it with white vinegar. The material to be dyed should be soaked in a mild Ivory dish detergent solution for a few minutes. Water softener is useful if your water is particularly “hard”. 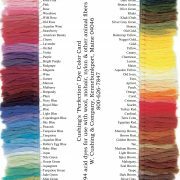 Acid dyes are great for wool fabric and yarn. . .if this is your first adventure into dyeing, let us know at check out so we can include instructions with your first order. 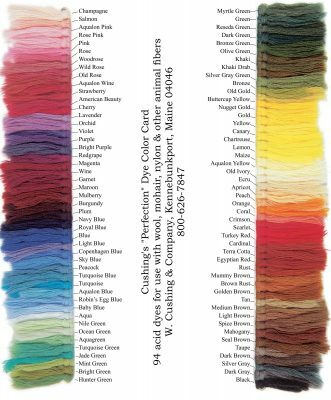 Please indicate if you are dyeing fabric or yarn as the process does differ slightly!